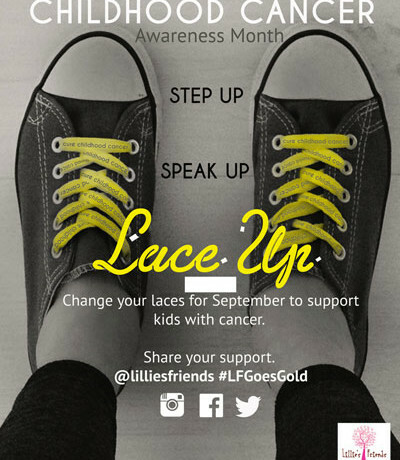 Step Up…Speak Up…Lace Up is an annual event in September where we raise awareness about childhood cancer by replacing our shoelaces. We encourage community members, classmates, teammates, family, and friends to replace their regular shoelaces with our Cure Childhood Cancer laces. 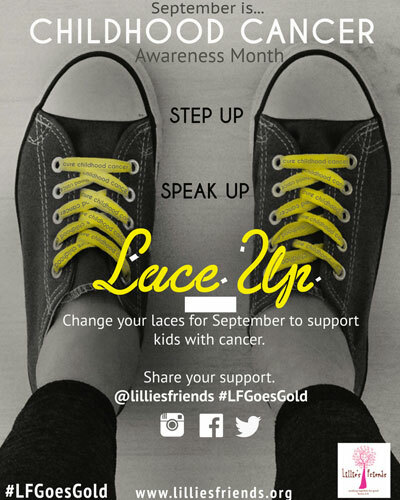 If you are a teacher or school administrator… You can setup a fundraising event at your school and have all of the kids replace their laces during September. If you are a coach… You can get your entire team to buy and change their shoelaces at a game in September, and then sell the laces during the game. If you are an individual… You can purchase laces online and buy for your friends and family. **Price includes shipping and handling.